Search our complete selection of vacation homes and condos in Sandestin® Golf and Beach Resort, Miramar Beach, and along the scenic Highway 30-A area. Russell Vacation Rentals is ready to work with you to select the right property for your beach vacation and make your beach vacation experience a pleasure in every way. From homes with golf carts included to condos and large single-family homes for the entire family, we have something for everyone. Book direct with RVR today! Russell Vacation Rentals manages a variety of properties in your favorite area beach communities including the many neighborhoods of: Sandestin Golf and Beach Resort Crystal Beach Miramar Beach Blue Mountain Beach Seagrove Beach Seacrest Beach With a large selection like this, youre sure to find the perfect property for your family vacation or accommodations for your corporate event or destination wedding. Voted one of the 10 Most Beautiful Places in America your beach vacation will a pleasure in every way! Contact a Guest Services agent at Russell Vacation Rentals to select, book and plan your perfect Florida vacation rental. Vacationing at Sandestin Golf and Beach Resort allows you a variety of residential options and dozens of amenities. Whether youre hosting a wedding party, corporate event, a family vacation or even a quick weekend getaway, Russell Vacation Rentals has the perfect Sandestin property for you! Many of our Sandestin vacation rental properties include updated finishes, fully equipped kitchens, open-floor plans, fresh linens, beautiful views of the Gulf of Mexico or Choctawhatchee Bay and many amenities just outside your door. In most properties, you are a short walk or bike ride away from the beach, the bay, and shopping and dining at The Village of Baytowne Wharf or nearby Grand Boulevard. Contact the Guest Service Agents at Russell Vacation Rentals to select and book your perfect Sandestin Golf and Beach Resort vacation property. The beaches of Miramar Beach have brought fun to families for decades. Beautiful white-sand beaches, emerald green waters, bright Florida sunshine and eclectic beach vendors offer your family, friends or special group options for adventure and a truly memorable vacation experience. 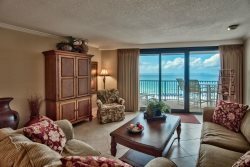 Located between Destin and Sandestin, Miramar encompasses Crystal Beach, Seascape, Henderson Beach and highlights some of the highest quality and most affordable vacation rentals along the Florida Gulf Coast. Visitors can play a challenging round of golf, take a charter expedition, or shop and dine a huge variety of boutiques and unique restaurants. Contact a Guest Services agent at Russell Vacation Rentals to select and book your perfect Miramar Beach rental today. The treasures along this 18-mile stretch of scenic highway include beautiful views of the Gulf, unique dune lakes and a continuous walking and biking path thats dotted with a handful of very unique, individual beach communities. From west to east Highway 30-A hosts the beach communities of: Dune Allen, Blue Mountain, Grayton, Watercolor, Seaside, Seagrove, WaterSound, Seacrest, Alys Beach, and Rosemary Beach. Russell Vacation Rentals hosts a variety of rental options in many of these communities and is ready to help you find the perfect selection for your 30-A stay. Each of these communities is diverse and offers a very particular style of beach vacation and we will help you find the best fit for you! Contact the Guest Service Agents at Russell Vacation Rentals to select and book your perfect 30-A vacation property. Looking for the perfect home away from home for your family? Interested in an intimate vacation experience with spacious living rooms, beautiful bedrooms, and same floor access to your own private lawn space? Consider booking a single family Miramar Beach or Sandestin vacation rental with Russell Vacation Rentals. Our Miramar Beach and surrounding area house rentals encompass a broad array of styles and layouts. Contact us today to find the perfect, unique fit for your next Florida Gulf Coast family vacation.